A message doing rounds on social media mentions about Kapil Sibal Plea in London Court to Defer Mallya Extradition till 2019 Polls in India. Don’t send Mallya to India right now as it will affect the election, Kapil Sibal allegedly told. No, the claims are not facts. Has Kapil Sibal Said – Don’t Send Mallya to India? The story in question first appeared in Hindi and later in English versions also. 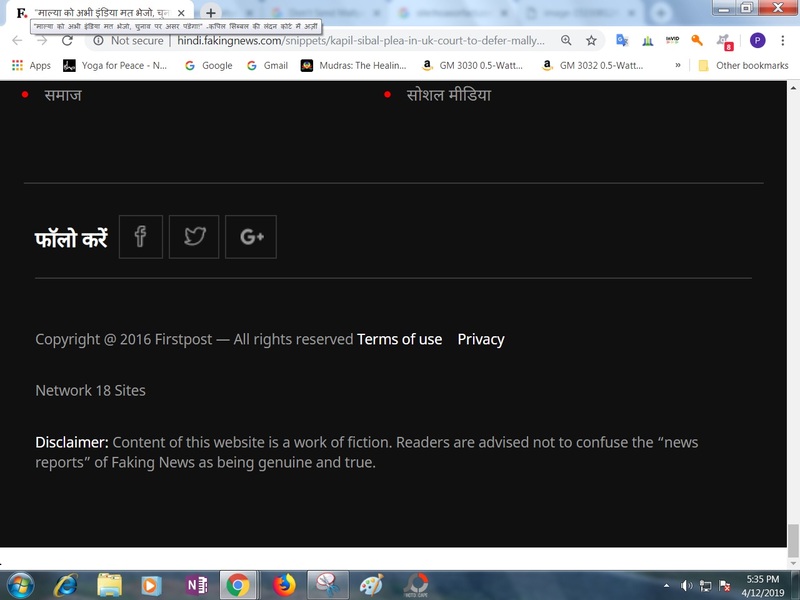 It in fact originated from an article on Hindi Faking News website hindi.fakingnews.com published on 6th February 2019. The article shared on their Facebook page garnered thousands of likes and shares before the screenshots appeared on other platforms including WhatsApp. The article states that Congress politician and popular lawyer Kapil Sibal submitted a plea in London High Court to stop the extradition of Vijay Mallya to India. It mentions the politician from opposition party to have said – don’t send Mallya to India until the completion of 2019 Lok Sabha elections – as ruling BJP party can take advantage of the case. Notably, the article further mentions a funny, imaginary conversation between Kapil Sibal and the London judge citing a popular Bollywood dialogue referring to pending court cases in India. As the name itself suggests, Faking News is fake news website of Indian origin, which publishes fictional content. The website also carries a disclaimer message at the bottom of their website. 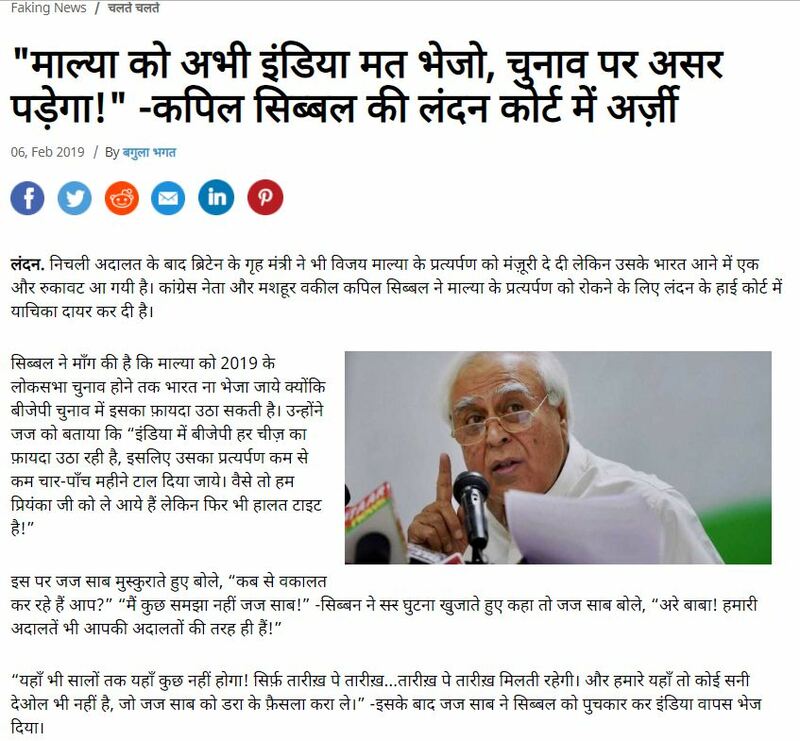 No wonder, there are no credible reports about the fake news claiming Kapil Sibal submitted a plea in UK court to defer Vijay Mallya extradition till 2019 polls in India. Vijay Mallya is an Indian businessman and a former member of Rajya Sabha, the Upper House of the Parliament of India. He owned and managed many companies and businesses including beverage alcohol, aviation infrastructure, real estate and fertilizer. Mallya was once listed as one of India’s wealthiest people, and was called the “King of Good Times” due to his extravagant lifestyle. However, since 2012 Mallya and his companies have been embroiled in many financial scandals, money laundering and controversies. Mallya fled India in March 2016 saying he wanted to move to Britain to live closer to his children. In December 2018, Westminster Magistrates Court ruled Vijay Mallya can be extradited from the UK to India where he faces fraud charges. Indian authorities are trying to get Vijay Mallya back over unpaid loans tied to his defunct Kingfisher Airlines and take criminal action. Mallya took over $1.4 billion (Rs 9,000 crore) in loans from Indian banks. On 3rd Feb. 2019, UK Home Secretary signed the order to extradite Mallya to India. Mallya responded on Twitter saying he will appeal to a higher court.